UNIVERSAL DUAL CURE CAPLLARY FILM-Magna/Cure® capillary films are photopolymer/diazo based, dual cure photostencil systems which provide remarkable image quality and exceptionally durable stencils. 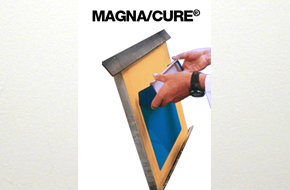 America's first dual cure film system, for use with UV, plastisol, water-based and solvent-based inks. Magna/Cure® pre-sensitized capillary film for printers demanding a premium quality stencil provides these additional benefits.